Ganesh Chaturthi 2017: Divyanka, who is filling up her Instagram with posts featuring Ganpati and the festivities, posted a selfie with Vivek and Ekta from inside the Kapoors' party, writing: "After a hearty meal... A selfie pose should be the dessert!" Television's star couple Divyanka Tripathi and Vivek Dahiya are busy stars but that doesn't mean they do not have time to do puja-hopping on Ganesh Chaturthi this year. On social media, the Yeh Hai Mohabbatein co-stars and real life couple were spotted taking selfies at Ekta Kapoor's star-studded Ganeshutsav celebrations on Saturday. The festivities were also joined by television's well-known names like Madhuri Matuli, Ekk Nayi Pehchaan actress Krystle D'Souza and Kasautii Zindagii Kay star Urvashi Dholakia - there's proof on Instagram. Divyanka, who is filling up her Instagram with posts featuring Ganpati and the festivities, posted a selfie with Vivek and Ekta from inside the Kapoors' party, writing: "After a hearty meal... A selfie pose should be the dessert!" The party host was also no less, sharing pictures from inside the party with hilarious captions like: "When you take ten pics to get one you look thin in." Jeetendra was also roped in for a picture with Karan Patel and her actress wife Ankita Bhargava. Karan, who posted the picture on Instagram, captioned: "Honoured to get clicked With the #Youngest #Actor in the industry, JEETU JI who I with immense respect and love call 'BAUJI' ... and ... the #Hottest #Producer in the industry Ekta Kapoor." #Honoured to get clicked With the #Youngest #Actor in the industry, JEETU JI who i with immense respect and love call 'BAUJI' ... and ... the #Hottest #Producer in the industry @ektaravikapoor .... ##Love You EKTAaaaa ...!...! 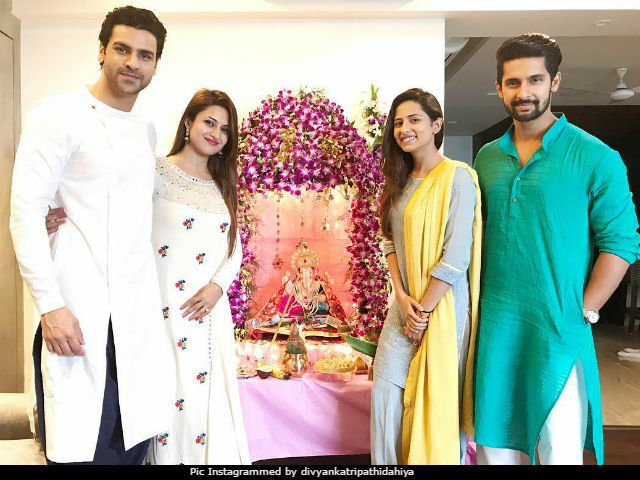 Ahead of Ekta Kapoor's party, Divyanka and Vivek joined actor couple Ravi Dubey and his wife Sargun Mehta for the Ganpati puja. The duo were also spotted hanging out at Ganesh Chaturthi elebrations hosted by the couple's friends-like-family. Divyanka was every bit pristine in a while embroidered ensemble designed by Purvi Doshi while Vivek also complimented her in traditional attire. Divyanka and Vivek had plans of dropping by 10 Ganpati pujas but could only make it to three: "Yesterday we planned to visit 10 Ganpati jis... Achieved 3," Divyanka Instagrammed. Congratulations for your first #Ganpati Mr and Mrs Dubey. Divyanka Tripathi and Vivek Dahiya met on the sets of Yeh Hai Mohabbatein and fell in love. The duo married in July last year and have been successfully setting couple goals with their jealousy-inducing social media posts.